The flagship model with HKS exhaust technology. Full independent layout of both right and left banks of V type engines. Full dual layout without 2-1 junction portion like stock exhaust system. Without performance drop due to the exhaust interference, it enables stress free revolution up to high rpm range. Full independent layout of both right and left banks of V type engines. The full dual layout prevents performance drop due to the exhaust interference. It enhances performance at high rpm. 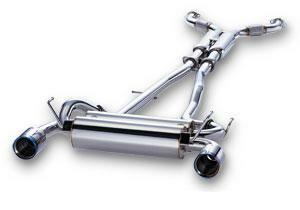 Balance pipe controls exhaust gas pulsation for exhaust sound stability and increasing torque at low rpm. Full Dual muffler weighs about 26kg compared to stock muffler about 30kg. It is about 13% lighter. The material of pipe and silencer is SUS304 with titanium tip. This combination improves durability and appearance.